Facebook has over 2 billion users worldwide. A Facebook page is a great place for restaurant online marketing. It’s an opportunity to present the climate and atmosphere of your restaurant, introduce your employees, and showcase your phenomenal meals. 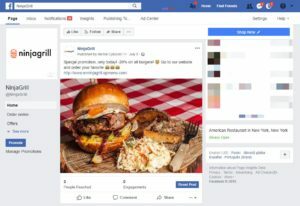 In the first part of the article, we will present 5 principles for managing a Facebook restaurant profile. Further parts will be posted soon. Regular posts are a very important issue. If you only publish once every few months, you won’t gain any new customers. Furthermore, you won’t have a positive impact on increasing the reach of your posts. Restaurant online marketing requires posts to be published at least several times a week. Assume a certain number of posts and follow this rule. 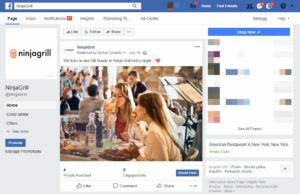 At least 3-4 posts per week should appear on your restaurant’s profile. Only then will it be up to date and attractive to your customers. Each review made by a customer is important and you should respond to all of them. 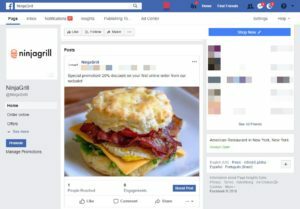 Regardless if it is a negative review or a positive one, deleting or ignoring opinions on Facebook will have a negative impact on the reputation of your restaurant. Before you respond to a comment, think about it carefully. If you offer a free meal to make up for a bad review, then you may face further similar negative comments. Social media is a new method for communicating with customers. It is significantly closer and more open so, it is worth thinking about every reaction to regain customer trust without losing your good image in the eyes of others. Sometimes, it is a lot more important to offer an apology, conversation, and mutual understanding rather than a free meal. 3. Ensure good resolution and naturalness of photos. Restaurant online marketing is largely based on photographs. They affect the senses, activate cravings, and generate curiosity. This is why it is so important to ensure good photo resolution. Food images should be natural, authentic, and attractive. When you don’t feel good enough to take photos yourself, it is worth employing a professional. If you want to try food photography yourself, make sure you read our article entitled: Professional photos of your dishes without a photographer – is it possible? What is worth paying attention to when photographing meals? Pay attention to the entire setting around the dish – ensure proper accessories and a matching background. It is important to add calls to action in post content, e.g. “Order now!”, “Check our latest promotions”, “See new items on our menu”. An ideal solution would be to redirect the customer to your own online ordering system on your restaurant’s website or mobile application. 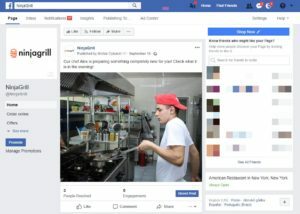 On your Facebook page, show others what happens at your restaurant. All the new products on the menu, changes to the interior, new meals, artistic events, contests, reviews, celebrity visits – it is well worth sharing news about all this on Facebook. Show everyone how your restaurant works. Restaurant online marketing requires transparency. Whether it’s a photo, a shared link or a short note published in a post. Tell your restaurant’s story. Facebook is great tool for online restaurant marketing. Use it for promoting your own online orders. When you share posts regarding the menu at your restaurant or special promotions, make sure you include links to online orders. If you would like to promote a certain product, you can use direct links! Read the article entitled…. and find out what benefits can be generated by promoting your menu in this way. 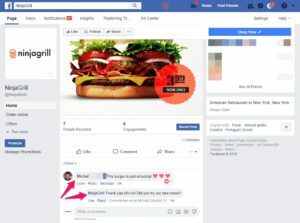 Thanks to integration of the UpMenu system with Facebook, you can launch online sales on your restaurant’s Facebook page. Due to the above, customers will place orders at your restaurant without leaving social media. This way, the number of orders and your profit will increase. 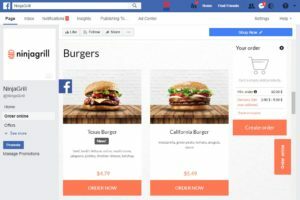 Check out Facebook ordering system. 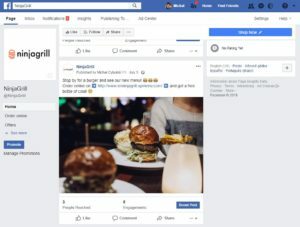 Managing a restaurant Facebook page is not a simple task. It certainly requires time, preparation of proper materials, creativity, and planning. Keep in mind that social media has huge potential. Use it for promoting your restaurant and building a trustworthy brand. We hope that the above tips will help you in managing your profile on Facebook. If you have any questions or would like to launch an online ordering system on your website or through a mobile application, contact us now!